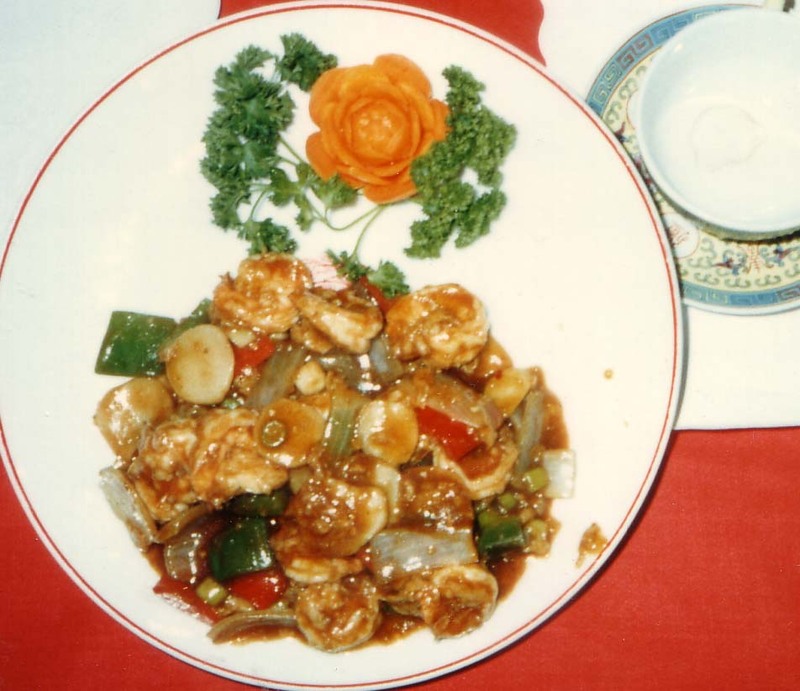 MANDARIN TANG RESTAURANT at 25TH Street Shopping Center in Easton PA was where the first ever Chinese cooking program in Pennsylvania was on on Cablevision; it featured Amy Tang as hostess. Sometimes there was a guest chef, always one or more tasting guests. You may recall the article her husband, Charles Tang, wrote. It was titled: In Memory of My Beloved Wife Amy. It was published in Flavor and Fortune’s Volume 17(4) on pages 35 and 36. Many chefs and Chinese cooking enthusiasts and also the editor of this magazine were featured on that program. 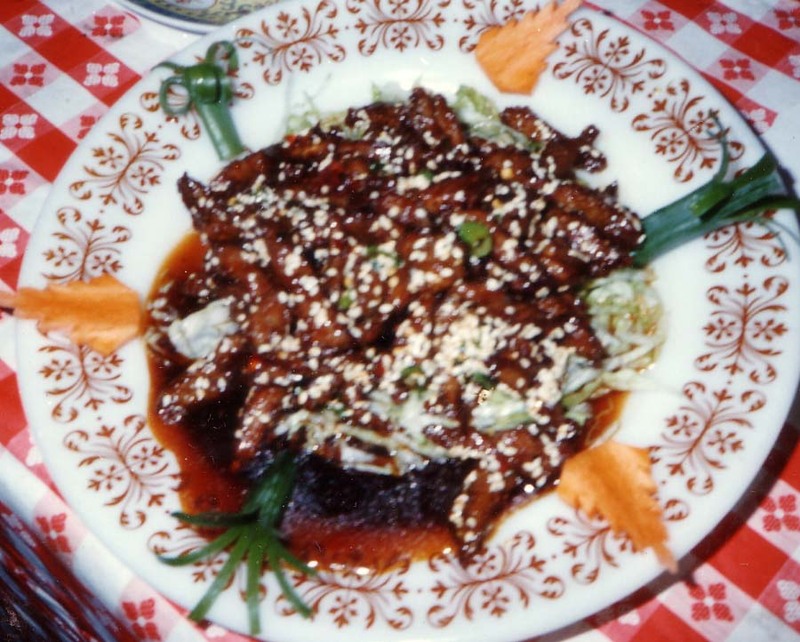 It was on every week for four years., and usually two different Chinese recipes were shown and tasted. The tasting guests were customers that evening. 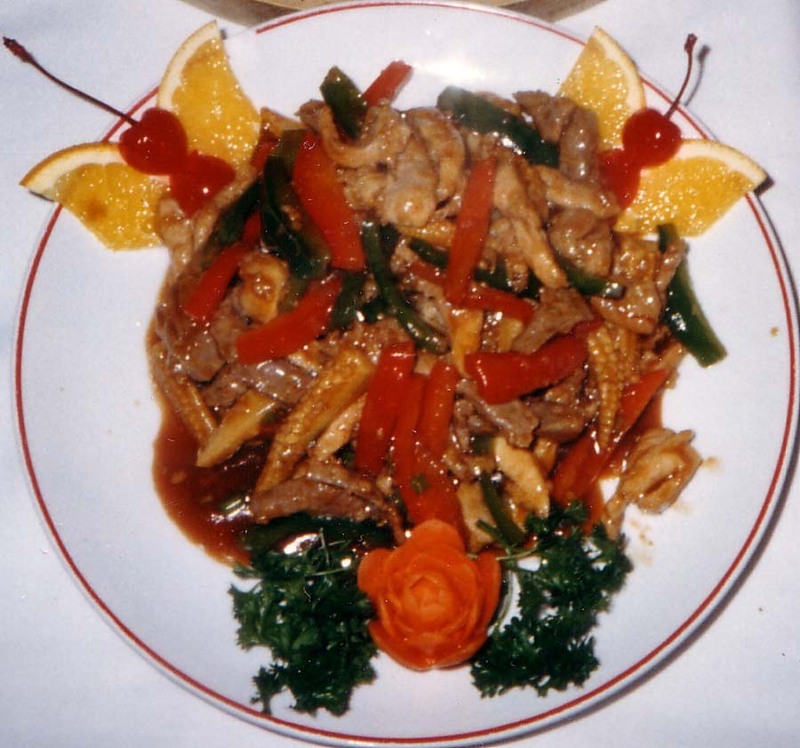 Some recipes were typical of those in Chinese restaurants at that time, others far ahead of their time. A few were published in local newspapers. Charles Tang generously shared many for our use. Rewritten in the style of this magazine, he thought everyone would enjoy them; and we do, too. Amy certainly loved them. She was the impetus for many of them. She even designed quite a few of them. Mr. Tang kept a collection of all of them, neatly typed and photographed, every one done at their Mandarin Tang Restaurant. For those who want more information, send an e-mail or snail mail letter to him at this magazine. 1. Heat a wok or pot and add two cups chicken soup stock and bring this to the boil. Add celery cabbage, carrots, bean curd pieces, and the snow peas and simmer for one minute, then remove vegetables from the wok or pot and discard the soup. 2. Put the other three cups of chicken soup stock into the wok or pot and bring to the boil. Add the vegetables and bean curd and return the stock to the boil then add salt, wine, and the pepper, and bring to the boil once more before adding the sesame oil. Then serve. 1. Slice chicken into thin strips and mix it with the egg white, salt, wine, pepper, and six tablespoons of cornstarch. Set aside for fifteen minutes. 2. Heat wok and add oil until it is about ready to smoke then add the chicken pieces a few at a time and cook them until about half done before removing them with a slotted spoon to a small bowl or plate. 3. Reheat the oil to about 400 degrees F and return the chicken pieces deep-frying them until they are golden brown. Remove them and set oil aside for another use. 4. 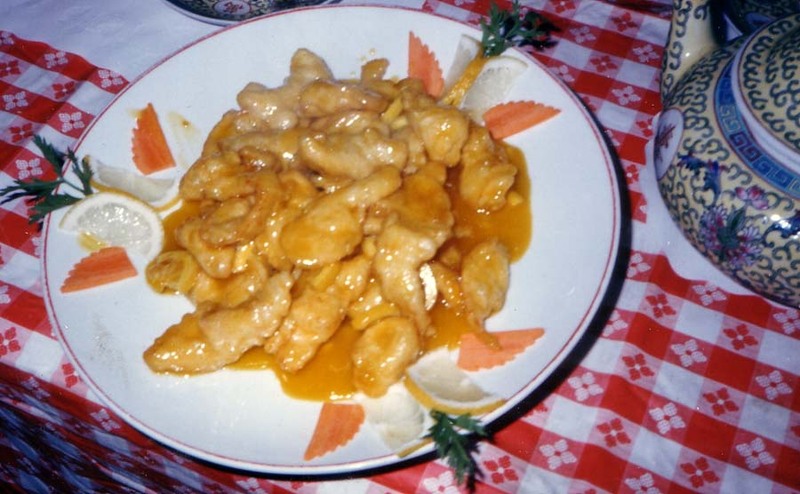 Put lemon slices, lemon juice and the sugar into the wok and bring to the boil, then mix and add the cornstarch mixture and stir until it thickens before adding the chicken. Stir to mix everything well, then remove to a platter, garnish with the lemon slices and carrot. and serve. 1. Mix one portion of salt, pepper, egg white, and cornstarch with the beef, the other with the chicken pieces. Add one tablespoon of the soybean oil to each of these, and mix well. 2. Heat oil and the chicken strips and when they turn color then add the beef strips and stir-fry for half minute or until the beef changes color, then add the red and green pepper pieces and the baby corn and stir-fry for another half minute before removing both meats and the vegetables and drain. 3. Remove all but two tablespoons of the oil from the wok (reserve for another use) and heat these tablespoons of oil. Add scallion pieces, the ginger and the garlic and stir-fry until aromatic (half minute) before adding the wine, stock, and the rest of the ingredients and stir once or twice then add the chicken/beef/vegetable mixture and stir. Remove everything to a serving bowl or platter and serve. 1. Peel shrimp and remove black vein from the back, then mix with half the sa cha sauce, soy sauce, wine, sugar, and the chili oil and marinate for fifteen minutes. 2. Heat wok, add the oil and the prawns stirring them until separated, then add the red and green peppers. When the shrimp have curled, about one to two minutes, remove them and the peppers and set aside. Discard all but two tablespoons of the oil reserving the large amount for another use. 3. Reheat this two tablespoons of oil, add the ginger and garlic, the other tablespoon of sa cha sauce, and the scallions, water chestnuts, and the onions and stir for about one minute or until fragrant. Then add the shrimp and the peppers and the cornstarch-water mixture. Stir until thickened, add the sesame oil, and serve on a platter. 1. Mix beef, salt, the teaspoon of soy sauce and two tablespoons of oil along with the cornstarch. Stir well, and let marinate for five minutes. 2. Cut scallion into one and a half inch lengths and split the ends to make them decorative. 3. Prepare Sichuan peppercorns and dried hot peppers crushing them with a cleaver or in a grinder and set aside; then fry sesame seeds in a dry pan until fragrant and then set them aside separately. 4. Heat wok or fry pan and add dry-fry the peppercorns and dried hot peppers; frying them in a half teaspoon oil taken from the oil for deep-frying. 5. Put the shredded lettuce on a plate, more on the edges than in the center. 6. Heat a wok, add the four cups of oil, drain the beef then deep fry it until all pieces separate, about one minute, then increase the heat and fry until they are crispy, remove from the oil and drain on paper towels, then mix the meat with two tablespoons of the soy sauce, the sugar, wine, and vinegar and let rest a minute or two before adding the peppercorn mix. 7. Put meat on the shredded lettuce, sprinkle with the sesame seeds, and serve.